Handcrafted Metal makes color coated Double Sweep range hoods that are customized to accommodate your kitchen and your taste. With us you can customize every dimension and feature, such as hammering, color tone, and lighting. 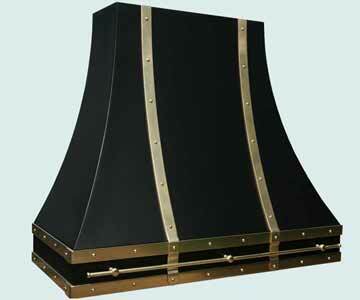 To further customize your color coated range hood you can also choose from additional features, such as elegant bottom bands, hand-wrought straps, clavos, and rivets. Personalized features like these are guaranteed to please. 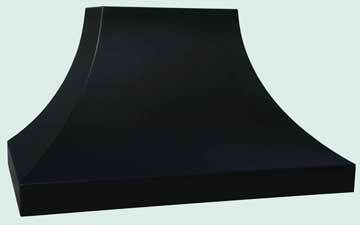 Our color coated range hoods are made with the highest-quality materials available, and are very durable. We will work with you to make a superior color coated hood that looks splendid in your kitchen. Click on any Double Sweep hood below to see more pictures, and customize it according to your specifications! This color coated Double Sweep hood is a sight to behold. It has thick brass straps with matching round head rivets. Additionally, a matching brass potrail is attached across the front of the hood between the straps on the bottom band. 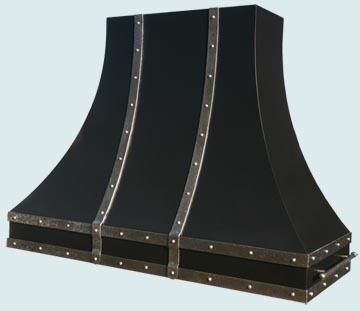 The straps, rivets, and pot rail have a shiny semigloss finish that contrasts beautifully against the black hood body. The black color coating is a high durability AGA powder coat. This color coated Double Sweep hood has 1/4" thick hammered steel straps with our French Grey patina. The straps are mounted with round-head steel rivets. Additionally, it has beautiful hammered steel pot rails on the ends. The color coating is a high durability AGA Matte Black powder coat, one of many in a vast array of available color coatings. This Double Sweep is finished with high durability powder coat. It is available in any color to fit your color-themed range or kitchen color scheme. It's shown in matte black, but available in other custom colors.